Different stages of port development to suit your motors requirements. The ports are measured and reshaped to provide the best possible amount of airflow through the cylinder head depending on what you require, then polished to an abrasion finish for the best air speed. The cylinder heads in the photos are just some of the cylinder heads previously ported. Genuine inquires please - check spam folder for reply sometimes it ends up there. Blake completed port & polishing on my BMW M20 head. The result was outstanding. The engine makes fantastic HP but the real special thing is the torque curve that is across the rev range. Not many have the skill set to achieve that result, Blake has that skill set. Blake reconditioned, and completed a full port + OS valve job on my RB26 head. the end product is amazing. Thoroughly recommended! Blake: Hi, please send a message to me through the email the service provider box on the auction. A 20% increase in torque in my chainsaw, I wouldn't have believed it. Highly recommended tradesman here. can ya shave my 4k-u head just very lil shave as there gasket ring had pushed into head surface..
Hey i was wondering how much to port a standard evo 6 exhaust manifold? Hey, thanks for doing my SR20 head over the weekend. another awesome job. 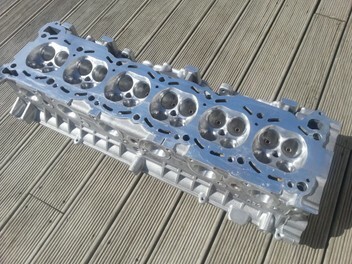 what sort of cost involve in porting a set of 304 vn v8 heads to around 400-450hp ? Blake: hi, thanks for your enquiry. Could you please write in the box above, " email the service provider " and i will be in touch.